Okay folks, here is something that is so simple I can’t believe we haven’t done it until now!?! Dehydrating! Actually, the reason we haven’t done it in the past is because our oven temperature wasn’t low enough and there is just too much shade where we live to do it outside. However, all this has changed since we recently purchased the Excalibur 3900. Look out berries, look out citrus, veggies, apples, and more! We plan to make dehydrating a regular part of our preserving plan and the skies are the limits. 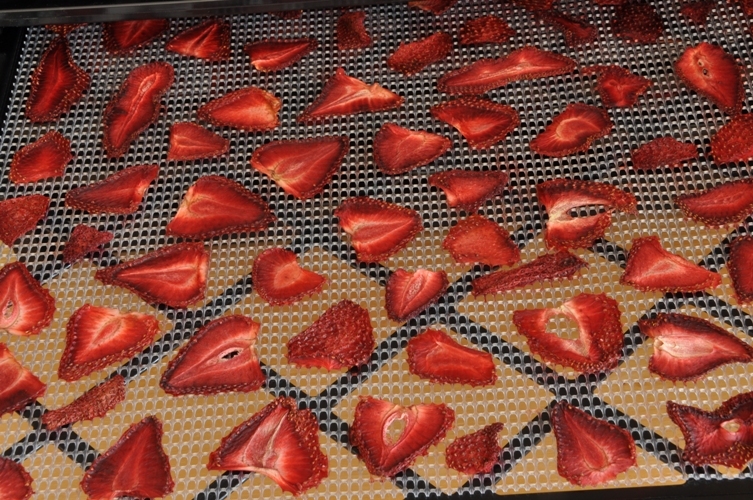 First up, dehydrating some freshly picked strawberries. We love making our own granola cereal and often purchase dehydrated fruits to include. But now we won’t have to because we can top our cereal, yogurt, or ice cream with these beautiful berries. We know where they came from, we picked them with our own two hands, washed them thoroughly, and sliced each one with care. There is something so satisfying about doing it yourself. Don’t you agree? We don’t think the following recipe will be very helpful unless you have a dehydrator and even then the drying times may vary but we thought we’d include it to show you how easy it really is. Who knows maybe you have a dehydrator or are thinking about getting one? This might encourage you to add dehydrating to your preserving projects. It really is simple, simple, simple! Wash strawberries well and remove stems. Cut into 1/4″ slices. Note: It’s important to try to cut the slices all the same thickness so that they will evenly dry. 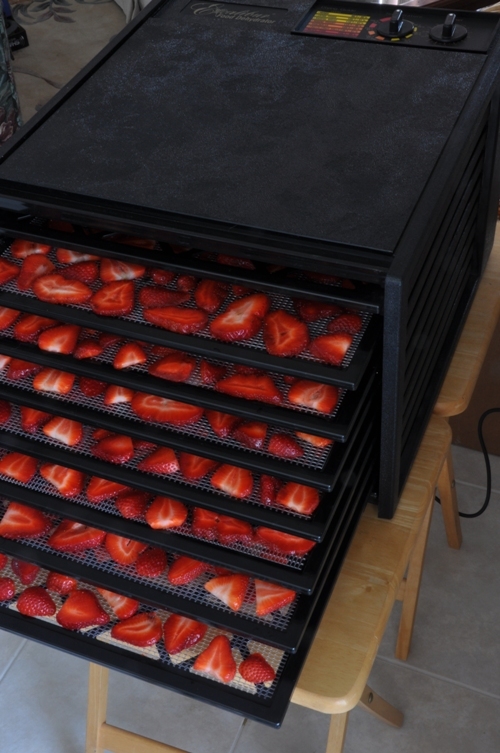 Lay berries onto dehydrating tray arranging them closely but not touching. Place trays into dehydrator for 8-10 hours. Check after 7 hours to see if they are the texture you like. If not, continue to dehydrate for up to 5 more hours. You want them pliable and leathery but not soft. 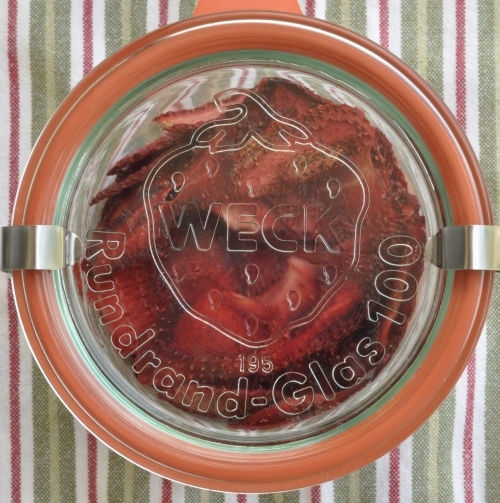 Label and store in clean sterilized mason jars. 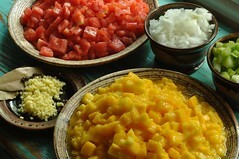 Note: If you live in a warm/humid part of the world you may want to refrigerate your dehydrated fruits and veggies. We live in Canada and will store them in our pantry. If condensation appears in your jars or Ziploc bags then they require further drying. ← Tomato Jam ~ I put that “$@%!” on everything! just a hint – if you use one of those egg slicer things with the wires on it for your strawberries – they’ll come out very nice and evenly sliced. Make sure you put the tip/skinny end of the strawberry close to the hinge side – it slices much more easily that way. That is such a great suggestion…thanks!!! I dried strawberries last year and they are SO good! They’ve been tossed in salads, granola, muffins and bread, rehydrated and blended with oil and basalmic for dressings, and eaten out of hand! Some of those little heart shaped slices were perfect for garnishing Valentine’s Day sweets. We have about a cupful left and 2 months to go before strawberries are in again. This year I’m going to dry them in halves instead of slices though because I felt the slices were just too shard-like after drying. Do you use a dehydrator? I’m so interested in trying to dehydrate everything and especially to try making our own salsa mixes and other things we still purchase. It’s so much fun and easy. I’m interested in how the strawberry halves turn out? It must add quite a bit to the drying time? Let us know how you make out. I did peaches and pears as halves last year. It did add to the drying time by a couple of hours but was worth it. They were definitely dry on the outside, not sticky, but the insides were kind of jam-like and intensely flavorful. We loved them. Michael and I finished up the few that were left last week and they had kept beautifully. How do you store all the different things you dehydrate? In mason jars? I forgot to mention I did a batch of Principe de Borghese tomato halves marinated overnight in maple syrup and cider vinegar a la Joel over at well preserved and those are quite mighty too! Mmmm that sounds so good! We’ll have to see how much maple syrup we get but this sounds like something we should try. Are you still in FL? If so, you may be driving right by us on your return trip! Doggies welcome! We just got home and the timing is perfect for tapping our maple trees. The sap should be flowing nicely today. Thanks for the invite…maybe next time? Any jar with a tight fitting lid. Some people recommend plastic bags but I found if there’s any extra moisture it has no way to evaporate and escape, and you don’t see it in time to possibly save what you’ve dried. Since a lot of what we put up is necessarily on view I wipe out our local charity and second hand shops of decorative jars on a regular basis for this purpose and save the canning jars for canning. Have fun with your trees! Today is the last day of the Highland County Maple Festival just north of us. I’m making maple vinegar with some of my score!